Children Shine in the Cardiff Cup at the Arms Park! Football fever hit the area as a festival of football hit Cardiff as teams from across Wales, from Penarth, Cardiff, Barry and far afield such as places like Swansea, Ceredigion, Gwent and Pembrokeshire ascended on Cardiff Arms Park the home of Cardiff Blues. 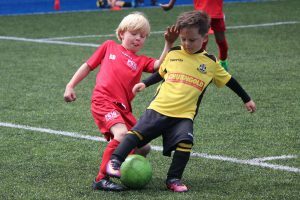 The non competitive festival aimed at U6 to U11 age groups saw over 180 teams and 1952 children taking part in the prestigious football festival played under the FAW mini football rules. As the children where paraded on the pitch before a ball was kicked as they enjoyed the opportunity to play in one of Wales historic stadiums.